Oregon's Senator Jeff Merkley, Representative Earl Blumenauer (OR-03), Senator Ron Wyden, Representative Suzanne Bonamici (OR-01), and Representative Peter DeFazio (OR-04) have introduced the Columbia River Basin Restoration Act. 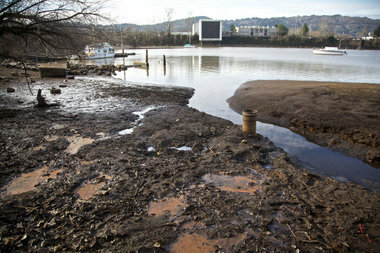 The legislation would authorize US$50 million over five years for the Environmental Protection Agency (EPA) to establish a voluntary, competitive Columbia Basin grants program for projects that assist in eliminating or reducing pollution, cleaning up contaminated sites, improving water quality, monitoring the basin, and promoting citizen engagement. Toxins are present throughout the Columbia Basin, and are harmful to humans, fish, and wildlife. These contaminants make their way into fish tissue and can be dangerous to humans if consumed. Some of these toxins are known to cause cancer and have been linked with neurological, developmental, and reproductive problems, including birth defects and learning disabilities. "The Columbia River is an Oregon icon that is central to both our environment and our economy," said Merkley. "A clean Columbia River is essential for the health of our communities and for the strength of our fishing and recreation industries. Congress should step up and help protect this Oregon gem." "The Columbia River is the lifeblood of the Pacific Northwest, providing energy, food, jobs and recreation, but it's become dangerously polluted," said Representative Blumenauer. "We must do all that we can to protect and restore this majestic river. I look forward to working with Senator Merkley and other members of the Northwest delegation to advance this legislation to address an issue critical to Oregon and the Pacific Northwest." "The Columbia River has served the people of the Pacific Northwest for eons as a source of food, energy, and a major highway for commerce," Wyden said. "Dedicating funds to cleaning up the river is critical to ensuring that it is protected from pollution that harms the people and ecosystem that depend on it. It is past time to provide this support for the Columbia River Basin, and I'm proud to introduce this bill that will improve water quality and protect the river for future Oregonians." "The Columbia River is a powerful economic force in Oregon. It helps carry goods to market, serves as a valuable source of energy, and provides food to tribal populations and others," Congresswoman Bonamici said. "We must reduce pollution and contamination of this critical resource. I am pleased to support the Columbia River Basin Restoration Act, which includes grants for projects that help preserve and protect the waterway." "The Columbia River is one of the most bountiful natural resources in Oregon, providing cultural, economic, and ecological benefits to many states," said Representative DeFazio. "I'm proud to join my colleagues in introducing a bill that will put significant federal investment behind meaningful restoration projects to improve water quality and reduce pollution of the Columbia River. Rising levels of toxins in the Columbia River Basin threaten Oregon's salmon and the livelihood of tribal communities and other Oregonians." The Columbia River is the largest river in the Pacific Northwest, and the only large aquatic ecosystem in the United States that currently receives no dedicated funding to clean up and monitor toxic chemicals. It is 1,243 miles long and its drainage basin extends into seven states. Approximately 8 million people inhabit the Basin, including members of several Tribal nations and angling groups who frequently fish in its waters. Historically, the Columbia and its tributaries have constituted the largest salmon-producing river system in the world, with annual returns peaking at 16 million fish. This bill is supported by a diverse group of stakeholders including the Lower Columbia Estuary Partnership, Columbia River Inter-Tribal Fish Commission, Pacific Northwest Waterways Association, and Salmon-Safe.